Words can deceive, people can pretend, but music alone cannot lie. Vladimir Tarasov had to visit China. China which is the center of a most ancient civilization and which holds the richest culture ever. This country attracts everyone; its magnetic force is known to everyone. Especially to those who never forget about their predecessor's experience. Especially to those who never break the generation circuit which goes from past into future but lock it. Especially to those, who combine archaic and avant-garde trends, traditions and novice, respect of a disciple and impudence of an artist. Vladimir Tarasov had to come to China - and he did. 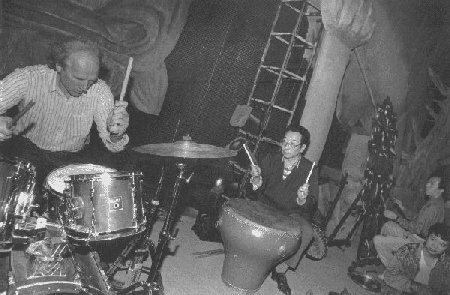 At the 1994 Beijing Jazz Festival Tarasov played with his old friends, the German musicians (Heinz-Erich Gödecke, Stephan Kersting). Again he was a success, like during similar festivals held in Europe, Russia or the United States. But that was in stage, while it was backstage where he made friends with the Chinese percussion ensemble, the Thundering Dragon. Seven drummers and cymbalists headed by their instructor Tiaen Xi (they work in the Beijing Central Opera as well as the Chinese State Broadcasting company orchestra) must have heard in Tarasov's music what they could never hear before, neither on stage nor in the recording studio. What they wanted to hear but what they couldn't. The Thundering Dragon was striving for the new percussion music, while Vladimir Tarasov headed for tradition, so this is why they met. According to laws of universal harmony their paths had to cross, and they did - on the margins of the Beijing Jazz Festival. Partners and associates who even never thought of such an encounter, nevertheless, turnded out to be quite ready for it. The tunnel was being made from the both sides due to common long-standing efforts. The seven "thundering dragons" as well as the "thunderous" Tarasov were playing together - for themselves, for each other, for a small, festival - unlike, audience, for the sake of a unique musical experience and, finally, for us who now listen to this CD. Vladimir Tarasov had to find himself in China. Similarly China had to find itself in Vladimir Tarasov. This has happened long before the fall of 1994. But today we hear the sound images recorded (and they couldn't be lost!) 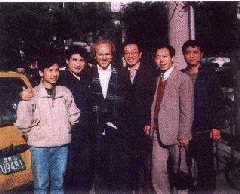 by some chance on a digital audio tape in a cold Beijing fall of 1994, featuring the Thundering Dragon's encounter with Vladimir Tarasov.